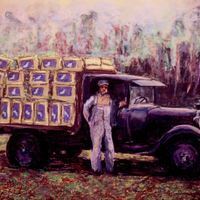 A painting by Bettye Reagan, a local artist in Central Florida, inspired by a photograph of Joe Lee, an African-American laborer, with Blue Goose celery at Charles Simeon Lee, Sr.'s farm in Oviedo, Florida, in 1928. The two Lees were of no relation. C. S. Lee (1892-1991) was born on October 27, 1892, and married Goldie Eva Beckley Lee (1892-1976) on April 21, 1915. During the Great Depression, Lee grew celery and bought 20,000 acres to start a cattle ranch. He passed away on November 9, 1991. Original painting: Reagan, Bettye. Loading Celery. 2003: Private Collection of Bettye Reagan. Digital reproduction of original painting: Reagan, Bettye. Loading Celery. 2003. "Joe Lee on Charles Simeon Lee's Celery Farm." RICHES of Central Florida. https://richesmi.cah.ucf.edu/omeka2/items/show/5649. "Joe Lee on Charles Simeon Lee's Farm." RICHES of Central Florida. https://richesmi.cah.ucf.edu/omeka2/items/show/6354. Dale, Nancy. The Legacy of the Florida Pioneer "Cow Hunters" In Their Own Words. Iuniverse Inc, 2011. "Lake Charm Circle, Oviedo...." The Orlando Sentinel, November 11, 1991. http://articles.orlandosentinel.com/1991-11-11/news/9111110197_1_oviedo-grandchildren-clarksville. "Goldie Eva Beckley." The Hennessee Family Genealogy Pages. http://www.thehennesseefamily.com/getperson.php?personID=I9802&tree=hennessee. Reagan, Bettye Jean Aulin. 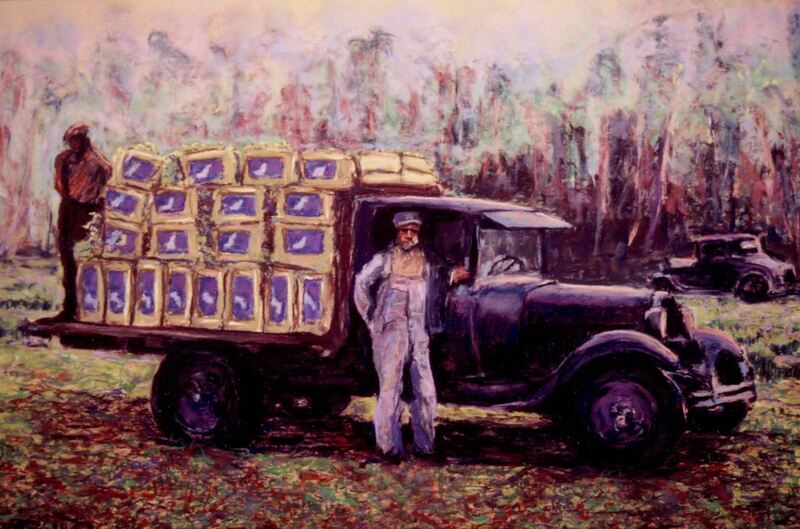 “Loading Celery by Bettye Reagan.” RICHES of Central Florida accessed April 19, 2019, https://richesmi.cah.ucf.edu/omeka/items/show/6932.